Obstructive snoring is a serious but very common sleep disorder that causes you to stop breathing during the night. The airway repeatedly becomes blocked, and limits the amount of air that reaches your lungs. When this happens, you may snore loudly or, more alarmingly, make choking noises as you try to breathe. Your brain and body become oxygen deprived and you may or may not wake up – this often leaves you very tired during the day. This may happen a few times a night, or in more severe cases, several hundred times a night. Possible diagnoses you may already have could include hypothyroidism, high blood pressure, depression or low testosterone levels. If untreated, obstructive snoring can lead to serious health issues, and in the worst case scenario, potentially death. One common form of treatment is a continuous positive airway pressure (CPAP) machine. Fulp Family Dentistry is pleased to offer our patients an alternative to CPAP that is both comfortable and convenient. 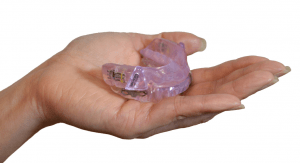 This oral dental appliance is worn only during sleep and fits like a sports mouth guard or orthodontic retainer. Much more convenient than a CPAP machine (for home and for travel), the oral appliance has been found to be just as effective. To learn more about the oral appliance and snoring treatment options in Tifton, please call Fulp Family Dentistry (229) 382-7996 and make an appointment.